The field of commercial spaceflight is ripe with youngercompanies hoping to make it big with new spaceships, but Orbital Sciences isdrawing on nearly 30 years of rocket-launching experience for its effort tobuild a new vehicle capable of stocking up the International Space Station. The Virginia-based company is building the unmanned Cygnusspace freighter and a new rocket, the Taurus 2, to launch it. The firstscheduled demonstration and operational launches are slated for 2011. "We're not a small, newly-formed company trying toestablish a track record of mission success, but we're also notbureaucratically hidebound," said Barron Beneski, vice president ofcorporate communications for Orbital Sciences. "I don't know that you canreally find that combination anywhere else in the industry." Founded in 1982, Orbital Sciences currently employs about3,500 people. Its flight record includes years of Pegasus rocket launches forcommercial customers, as well as launches of the Minotaur rockets that haveserved U.S. government and military payloads. "We let the track record of our products speak foritself," Beneski explained. Orbital holds a $1.9 billion contract with NASA for eightflights to resupply the space station, and is slated to form an integral partof the new U.S. commercial fleet alongside SpaceX's Falcon9 rocket and Dragon spacecraft, as well as other boosters. NASA also has a $1.6 billion contract with theCalifornia-based SpaceX (short for Space Exploration Technologies) for unmannedcargo flights to the space station. SpaceX is preparing to launch its firstFalcon 9 test flight in the next few months. Orbital?s cylindrical Cygnus freighter includes apressurized cargo module that can carry up to 5,952 pounds (2,700 kg) ofpayload. Its service module contains avionics, power, communications andcommand and control. "The service module is being designed to humansafety standards, because it operates in close proximity with the space stationbefore the robotic arm grapple," Beneski noted. Orbital also has other prior history with human safetystandards, as a lead contractor which helped create the Orion Launch AbortSystem that would have helped NASA astronauts escape in the event of anemergency involving the now-cancelled Ares I rocket. "We are probably the industry expert these days inlaunch abort systems through our work on Orion, so that know-how and capabilityresides in Orbital," Beneski said. Beneski declined to say that Orbital was aiming forcertain to carry astronauts into orbit. But he did note that the existingsystems put Orbital in a good position to take advantage of such anopportunity. "Certainly we have the service module which couldplay a role there, and then the escape system is certainly within Orbital'scapability," Beneski said. "We are ready should NASA go down thatpath." Orbital's recent launch history includes the failedlaunch of its Taurus XL rocket last year, which crashed NASA?s Orbiting CarbonObservatory into the sea because a payload fairing failed to separate. But thenew Taurus 2 offers a new slate. The company is currently working to develop a newMinotaur 4 rocket for the U.S. military. That rocket is slated for a May 2010test launch from Alaska. Some critics have fretted about untried commerciallaunch vehicles doing much of NASA's lifting in the near-future. Last month, President Barack Obama proposed that NASAcancel its Constellation program building the new Orion spacecraft and Aresrockets in line to replace the agency?s space shuttles. Instead, the presidentdirected NASA to set aside funding to support the development of commercialspacecraft capable of launching U.S. astronauts into space. But commercial spaceflight representatives counter thatlarge aerospace companies have provided the vehicles for NASA all along. "It's a disservice to focus on the newcomers andleave out the Boeings, Lockheed Martins and General Dynamics that have been inbusiness for 50 years," said Bretton Alexander, president of theCommercial Spaceflight Federation, during a February teleconference with spaceindustry executives and reporters. Beneski maintains a tempered optimism about the future ofcommercial spaceflight. But he clearly stated that commercial firms have muchof the right stuff to keep U.S. spaceflight alive in the 21st century. "Under the right circumstances, we believe that thecommercial industry ? with proper government oversight on safety ? can do this,"Beneski said. Orbital had already begun developing the Taurus 2 rocketbefore it received its NASA contract. The rocket is designed to not only help deliver cargo tothe space station, but to also launch medium-class satellites into low-Earthorbit and help fill the gap left by the impending retirement of the Delta 2rocket sometime in 2011. 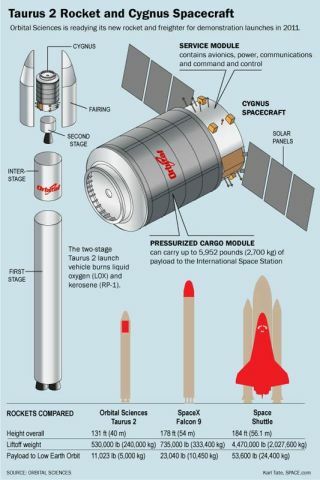 "Taurus 2 is a perfect fit as the launcher of acargo-carrying spacecraft, which we subsequently developed and named Cygnus,"Beneski told SPACE.com. The company has begun testing a pathfinder version of theliquid-fuel AJ26 rocket engine that powers the Taurus 2's first stage at NASA?sStennis Space Center in Mississippi. The engine is a commercial version of oneoriginally designed to help Russia's N-1 rocket fly cosmonauts to the moonduring the Cold War. Beneski anticipates seeing a final delivery of Taurus 2and the Cygnus spacecraft to Wallops Island, Va. later this year, so that therocket and spacecraft systems can be combined.